After a successful 17-years of operation, the University of Maryland MRSEC closed down in September 2013. This site, which focused on the third successive grant period from 2005-2013, remains as a history of the center, but will not be actively maintained. Dr. Ellen D. Williams is the Chief Scientist for BP, a position she has held since 2010. She is currently on a leave of absence from the University of Maryland where she has served as a Distinguished University Professor in the Department of Physics and the Institute for Physical Science and Technology since 2000. Dr. Williams has served as a Professor in the Department of Physics at the University of Maryland since 1991. She founded the University of Maryland Materials Research Science and Engineering Center and served as its Director from 1996 through 2009. Dr. Williams received a B.S. in Chemistry from Michigan State University and a Ph.D. in Chemistry from the California Institute of Technology." MRSEC, along with the rest of the University of Maryland, will be once again opening its doors to the community April 27, 2013 for Maryland Day. Come by to make silly putty polymers, UV-sensitive color-changing bead bracelets, or try out the UV-sensitive color-changing nail polish. We hope to see you there! The University of Maryland MRSEC congratulates Jillian Epstein, former MRSEC REU Student, on being awarded a fellowship from the National Science Foundation's (NSF) Graduate Research Fellowship Program! Jillian commented, "working in [Dr. Ehrman's] lab during the MRSEC REU inspired me to pursue a career in research and also guided my research interests toward developing novel energy and electronic materials." Best of luck to Jillian in her graduate research endeavors! [03/26/13] MRSEC's Newest Museum Exhibit "How Do You Nan-Know?" MRSEC has created a new museum teaching exhibit piece as part of a How Do You Nan-Know? exhibit partially funded by NISE and created by the MRSEC and Port Discovery Children's Museum. This series complements the MRSEC-created "NanoFabulous" and NISE "Nano" exhibits already in the museum. The How Do You Nan-Know? series is designed to help young visitors identify nano in their neighborhood and evaluate how they make value descisions about nano and other criteria in their everyday lives. Meet nanoscientist Dr. Michael Fuhrer from the University of Maryland MRSEC for an interactive talk on nano! Dr. Fuhrer will be at Port Discovery Children's Museum on Saturday, September 8, 2012 at 1:00 PM by the "NanoFabulous" and "nano" exhibits. Dr. Fuhrer is an expert in nanoscale electronics that are changing our world! Interested? Want to invite your friends? Share the event on Facebook or print a flyer! The MRSEC "Nanoscience: The World Smaller than a Human Hair" camp took a field trip to the University of Maryland MRSEC-developed NanoFabulous exhibit at Port Discovery Children's Museum! Camp instructors used the exhibit as a teaching tool for nanoscience concepts. For more information about NanoFabulous, see the press release, pictures of the exhibit online, or visit the exhibit at Port Discovery Children's Museum through October 2012. The 2012 Mission Possible: Science Behind Spying Camp has successfully concluded! Check out the highlights of MRSEC's newest agent recruits in this picture slideshow! Note: this slideshow is a PowerPoint show (.ppsx). If you do not have Microsoft PowerPoint, you may download the free PowerPoint Viewer to view the slides. MRSEC Ph.D. student Michelle Groce will be speaking as part of the Institute for Academic Challenge (IAC)'s Community Seminar Series on July 22. This event is free and open to the public. No registration required. View pictures of the event in our gallery on Facebook. MRSEC is proud to partner with APS, AAPT, ASA, OSA, SPS, and AIP to present Big Top Physics at this year's USA Science & Engineering Festival Finale Expo. Come one, come all to the greatest physics show on earth! Ever wonder how circus tricks are managed? Come into our circus and find out! Barnum and Bailey have nothing on us. The expo will be open to the general public April 28-29, while "Sneak Peek Friday" will give school field trip students a chance to dive into STEM. Find Big Top Physics in Hall B, Booth Number 1527. For directions and more information about the Expo, visit http://www.usasciencefestival.org/. MRSEC, along with the rest of the University of Maryland, will be once again opening its doors to the community April 28, 2012 for Maryland Day. Come by to make silly putty polymers, UV-sensitive color-changing bead bracelets, or try out the UV-sensitive color-changing nail polish. We hope to see you there! "NanoFabulous," a nano exhibit developed by the University of Maryland MRSEC, was unveiled April 12, 2012 at Port Discovery Children's Museum in Baltimore, MD. Speakers included Port Discovery President and CEO Bryn Parchman, MRSEC Director Dr. Janice Reutt-Robey, MRSEC Associate Director and Director of Education Donna Hammer, and Maryland Congressman Dutch Ruppersberger. News coverage of the event was featured on WJZ, CBS Baltimore. See the press release, pictures of the exhibit online, or visit the exhibit at Port Discovery Children's Museum through October 2012. One of the grand challenges presented by nanotechnology is achieving the fabrication of immense numbers of nanometer sized structures with controlled placement, on a practical time scale. Directed self-assembly in which a template of some form is employed for the spontaneous assembly of structures, via interplay of kinetics and energetics is seemingly one approach toward achieving this. Here we use Kinetic Monte Carlo simulations to investigate whether a predefined topographical pattern, in the presence of an “extra” diffusion barrier to an atom crossing a step (“Ehrlich-Schwoebel barrier”) can lead to self assembly of a variety of ordered arrangements of nanometer-sized “mounds” during epitaxial growth on a patterned substrate. This video shows the progression of the topography in this system using a moderate Ehrlich-Schwoebel Barrier of 0.1 eV, with a growth rate of 1 monolayer/s, at a temperature of 740K. The frame rate is logarithmic in time as most of the changes occur early on. The overall thickness grown is 500 monolayers. As part of MRSEC’s seven-year partnership with Charles Flowers High School’s Project Lead the Way Program (PLTW), the MRSEC presented Reinforced Concrete Properties and Design materials science activities to students this week. Developed by MRSEC Associate Director D. Hammer, these inquiry-based activities are part of MRSEC’s pre-engineering program, which supports and extends PLTW curriculum. MRSEC has a highly successful service-based approach to education outreach and classroom implementation was led by MRSEC MSE researchers Dr. John, graduate students Paul Patrone and Romaine Isaacs, and Donna Hammer. These activities will be followed by visits to the University of Maryland Modern Engineering Materials Instructional Laboratory, where students will test their concrete beams, and MRSEC Shared Experimental Facilities (SEM and TEM). Students indicated that these activities are important to their education and increased their interest in an engineering career. MRSEC is co-sponsoring its 6th annual "Operation Night Spy" KidSpyTM Workshop for ages 10-13 at the International Spy Museum on Thursday, February 9 from 7PM to 9PM. See more information about UMD-MRSEC's partnership programs with the International Spy Museum or watch the video of highlights from the 2011 Operation Night Spy. Registration details can be found at the Spy Museum website. [10/07/11] Photos from the 2011 MRSEC Summer Camp Programs now available online! MRSEC faculty John Cumings will be presenting a seminar as part of the MSE Seminar Series on Friday, Sept. 16, 2011 at 1:00PM in room 2110 of the Chemical and Nuclear Engineering Bldg. Transmission electron microscopy (TEM) is a powerful tool for determining the structure of materials at the nanoscale, but it also provides high bandwidth for rapid characterization, which is unique among nanoscale imaging techniques. This presents the possibility of studying dynamic prototypical devices and other test structures during their operation, in-situ inside the microscope. In this talk, I will present my work since 2005 here at the University of Maryland building a research effort in the area of in-situ TEM, with a focus on electrical and magnetic nanosystems. The presentation will have two foci, thermal imaging of carbon nanotubes and interacting magnetic nanostructures. For the thermal imaging of carbon nanotubes, we have developed a new thermal imaging technique that we call electron thermal microscopy. Using this technique, we have shown that we can measure and control the thermal contact resistance between carbon nanotubes and neighboring materials, and these results contribute to the general knowledge of these phenomena. Additionally, more recent results on current-carrying nanotubes suggest the existence of a new mechanism of Joule heating at the nanoscale, where a nanotube may dissipate heat directly into a neighboring material without heating itself. On the topic of magnetic nanosystems, I will present work on nanoscale magnetic elements that are arranged in controlled lattices. These structures have been called artificial spin ice, and have been shown to mimic the behavior atomic magnetic moments arranged on analogous lattices of rare-earth magnetic oxides, called spin ice. These lattices exhibit a phenomenon known as frustration, which will be introduced in this context. Other relevant nanosystems will be briefly introduced. More information is available on the MSE website. The 2011 REU Poster Session is taking place August 12, 2011 at 12:00pm in the Rotunda of the Jeong H. Kim Engineering Building. See the abstracts. Nanoparticles mixed with organic liquid crystals could be the cost-effective future of photovoltaic (solar powered) devices. This work is the first to demonstrate a hybrid photovoltaic system made from nanoparticles and liquid crystals, and the first to prove that a specific ordering of the liquid crystals with the nanoparticles results in higher electrical currents. The photovoltaic materials used in today's solar cells are solid state and expensive, two factors which have prevented their widespread adoption. The development of an effective liquid crystal-based photovoltaic would not only result in more affordable products, but also more design options, since the liquid crystal could be housed in flexible or custom-shaped containers, or possibly applied as a coating. Different concentrations of ZnO nanoparticles of 5 nm diameter were mixed with liquid crystal 8CB to measure their current-voltage characteristics and the degree of ordering of the liquid crystal. The current in the system increases by almost three orders of magnitude for a concentration of ZnO nanoparticles of 30% weight. Further increase in concentration results in lowering of the current. The increase in current is associated with a mutual ordering of the nanoparticles and the liquid crystal. The group is now investigating the behavior of ZnO elongated nanorods and nanowires with liquid crystal. Fig. 1 TEM image of 5 nm ZnO nanoparticles. Fig. 2 I-V curves from a mixture of liquid crystal 8-CB with ZnO nanoparticles with different concentrations. See: "Liquid crystal-ZnO nanoparticle photovoltaics: Role of nanoparticles in ordering the liquid crystal." L. J. Martínez-Miranda, Kaitlin M. Traister, Iriselies Meléndez-Rodríguez, and Lourdes Salamanca-Riba. Applied Physics Letters 97, 223301/1-3 (2010). [04/13/11] Nature Physics: "Tunable Kondo Effect in Graphene with Defects"
MRSEC researchers, led by Dr. Michael Fuhrer, have discovered a way to control magnetic properties of graphene that could lead to powerful new applications in magnetic storage and magnetic random access memory. Results were published in Nature Physics; see also the press release via the UM Newsdesk. MRSEC, along with the rest of the University of Maryland, will be once again opening its doors to the community April 30, 2011 for Maryland Day. Come by to try our ice cream made with liquid nitrogen and make silly putty polymers, UV-sensitive color-changing bead bracelets, or try out the UV-sensitive color-changing nail polish. We hope to see you there! This movie shows some of the interesting dynamical instabilities and transient step patterns that can form on a growing crystal surface in the presence of impurities that slow down the crystal growth, using a modern version of a model that was first suggested over fifty years ago by F. C. Frank . The movie starts with a top view of a vicinal surface of a bulk crystal with equally spaced surface steps (shown as lines with different colors) that descend on going from left to right. A liquid solution contains bulk material as well as a small concentration of impurities is located above the surface but not shown in the movie. Initially the system is at equilibrium so the steps do not move, and a uniform equilibrium distribution of impurities (shown in red) is established on the crystal surface as the impurities slowly adsorb and desorb from the terraces between the steps. Under nonequilibrium conditions caused by a supersaturation of bulk material in the solution, crystal growth occurs by the rightward motion of the surface steps as bulk material from the solution joins the crystal at each step edge. But an impurity adsorbed on the surface locally impedes or blocks the motion of a surface step segment just behind it and hence slows down the growth of the crystal. However, once a step segment moves past an impurity it dislodges it, effectively sending it back into the solution above. Thus during crystal growth there is a lower concentration of surface impurities just behind a moving step than in front. This can cause a step bunching instability since if a perturbation causes one step in a uniformly moving step train to slow down there will be more time for additional impurities to adsorb on the terrace in front. These will cause the step to slow down even more, thus allowing other moving steps behind to catch up and form a larger step bunch. As the movie begins there is a sudden increase in the concentration of the bulk component in the solution. This supersaturation causes slow crystal growth even in the presence of impurities as adatoms attach to the surface steps. Initially the individual steps are well separated and as each step moves it dislodges the impurities just in front of it, leaving an essentially impurity free region just behind. This permits the next step behind to move faster when it reaches the region cleaned of impurities by the first step. Thus after a short initial period there is a rapid increase in the overall crystal growth rate as each moving steps efficiently cleans the surface of the impeding impurities for the next step and we see single steps and small bunches of steps moving rapidly together. However as time goes on the bunching instability causes larger and larger step bunches to form with characteristic v-shaped patterns. These are less effective in cleaning the surface of impurities since effectively only the first step in the bunch removes any impurities. Thus the bunches slow down as they coarsen and the impurities finally win out at long times. F.C. Frank, in: "Growth and Perfection of Crystals" (R.H. Doremus, B.W. Roberts and D. Turnbull, eds), p. 383, Wiley, New York (1958). The March 2011 edition of MRSEC Matters, the UMD-MRSEC newsletter, is now available. Check it out! New MRSEC faculty member Robert Briber, chair of MSE, will be giving a public lecture on materials science and the role of materials in society, the first of several public lectures planned through the Marquee Courses in Science and Technology. "The Marquee Courses in Science and Technology is a signature program developed at the University of Maryland to address the national need for an appreciation and understanding of how science, technology, engineering, and mathematics can provide solutions to present and future world challenges." For more information about the Materials of Civilization (ENMA 150) course taught by Dr. Briber, see "Non-Majors Delve Into Materials Science." From the chemistry of liquid crystals, to the mechanics of smart wire, to the high tech know-how of new nano materials, science holds the answer to many-a-spy’s secrets. In this educator workshop, teachers will learn how to use espionage scenarios as a context for standards-driven science content and activities. Participants will have an opportunity to explore inquiry-based nanoscience activities that can be replicated in the classroom. Working in partnership, the University of Maryland Materials Research Science & Engineering Center (MRSEC) and the International Spy Museum have created resource materials for classroom use. Bob Wallace, former head of the CIA Office of Technical Services will deliver a keynote lecture about the role of science and technology in spying. *All participants will receive a STEM classroom kit with accompanying resource manual containing lesson plans, student worksheets, and sample materials. A picnic-style dinner will be served. See the event information on the Spy Museum's website or download a flier. Operation Night Spy 2011 was a great success! Thanks to all those who participated. Video coming soon! MRSEC is co-sponsoring its 5th annual "Operation Night Spy" KidSpyTM Workshop for ages 9-12 at the International Spy Museum on Thursday, February 24 from 7PM to 9PM. Registration and details can be found at the Spy Museum website. MRSEC graduate student Michelle Groce and team have funded a non-profit Institute for Academic Challenge. Read more on our Education page. [12/21/10] Port Discovery Children's Museum hosts "Noontime New Year! A Masquerade Bash"
If you're looking for some family-friendly New Year's fun, check out Port Discovery's Noontime Masquerade Bash with Eric Energy. The event runs from 10am-5pm on December 31, and includes a New Year countdown at noon (complete with a milk toast)! Eric Energy will also be presenting an interactive science show and demonstrations at 12:30pm and 1pm. See the Port Discovery website for more information about the event or download an event flyer. The Prince George's County Public Schools newsletter, Education Insight, features the Project Lead the Way program, including MRSEC Associate Director Donna Hammer with Congresswoman Donna Edwards during her visit to C.H. Flowers High School. See pages 4 and 6 of the December 7th edition (pdf) for more, or find the most recent edition of Education Insight here. This week, the UMD MRSEC was in attendance for a special visit to Charles Flowers High School from Congresswoman Donna Edwards. The event was highlighted by a program overview by PLTW teacher Victoria Lee, classroom tours, student presentations, and remarks by Congresswoman Edwards and MSDE Program Manager Lynne Gilli. The UMD MRSEC was recognized as a major program partner and acknowledged for providing students with academic year pre-engineering activities and summer camp programs. As part of MRSEC’s six-year partnership with Charles Flowers High School’s Project Lead the Way Program (PLTW), the MRSEC presented 2 materials science activities this week, Polymeric Materials and Manufacturing Processes and Reinforced Concrete Properties and Design, to 9th and 10th grade students. Developed by MRSEC Associate Director D. Hammer and MRSEC Assistant Director of Education Outreach Programs A. Prasertchoung, these inquiry-based activities are part of MRSEC’s pre-engineering program, which supports and extends PLTW curriculum. MRSEC has a highly successful service-based approach to education outreach and classroom implementation was led by MRSEC MSE researchers Dr. John Cumings and graduate students Paris Alexander and Chris Long. These activities will be followed by visits to the University of Maryland Modern Engineering Materials Instructional Laboratory, where students will test their concrete beams, and MRSEC Shared Experimental Facilities (SEM and TEM). Students indicated that these activities are important to their education and increased their interest in an engineering career. The workshop will feature talks and discussion of current research and future plans in multiferroic materials by members of the oxides team of the NSF supported UMD-MRSEC and several outside speakers. The main theme will be the physics of magnetic and ferroelectric domains and their interactions. In addition to a series of speakers, there will be a poster sessions featuring current research activities. See the flyer for more information. MRSEC Seed investigator Edo Waks will receive the Presidential Early Career Award for Scientists and Engineers (PECASE), the U.S. government's highest honor for outstanding scientists and engineering in the early stages of their independent research careers. Awardees are chosen on the basis of pursuit of innovative and far-reaching developments in science and technology, and commitment to community service in furthering awareness of and knowledge in science and technology. For more information, see the NSF press release. MRSEC presented a series of demos and hands-on activities designed to educate and excite families attending the USA Science & Engineering Festival Expo on the National Mall about science and engineering. The event was a great success! Check out the pictures from the weekend: USA Science & Engineering Festival Photo Gallery (also available on Facebook). Join MRSEC at the Educators' Night Out at the International Spy Museum and explore the science behind spying. Your mission: uncover new and exciting resources to invigorate your curriculum. In this exclusive event teachers will receive spy-related education materials for all subject areas, gain insider information on intelligence in today’s world from the International Spy Museum’s executive director and veteran CIA spy, Peter Earnest; learn the Secret History of History from the museum’s historian, Mark Stout; and try their hand at spy tradecraft in Operation Spy. All this while enjoying a picnic-style dinner by Zola! Visit the International Spy Museum's site for registration information. An IRG 2 Workshop will be held November 30, 2010. More details to come as they are finalized. The MRSEC Fall Meeting will take place at 3:00pm on October 12, 2010. This meeting is for all MRSEC members. Details will be sent via email. [09/17/10] Workshop: Non-equilibrium Interface and Surface Dynamics: Theory, Experiment and Simulation from Atomistic to Continuum Scales, October 25-28, 2010. MRSEC is proud to provide funding for the Center for Scientific Computation and Mathematical Modeling (CSCAMM) workshop on Non-equilibrium Interface and Surface Dynamics: Theory, Experiment, and Simulation from Atomistic to Continuum Scales. The workshop will take place October 25-28, 2010 at the University of Maryland. The organizing committee includes MRSEC members John D. Weeks, Raymond P. Phaneuf, Theodore Einstein, Dionisios Margetis, and James W. Evans from Iowa State University. Session chairs include MRSEC professors Theodore Einstein, Janice Reutt-Robey, and Dionisios Margetis. For more information, please see the workshop schedule, website, or print a flyer. [09/16/10] Join MRSEC at the USA Science & Engineering Festival in Washington, DC: October 23-24, 2010! MRSEC will be part of the expo on the National Mall October 23-24, 2010. Find MRSEC at The Nano Age, Section NM-2, Booth Number 227 and mention "BUCKYBALL" to be entered into a drawing for a cool plasma ball. Check back for our schedule. Your Mission: Use the science of spying to infuse your curriculum with exciting new standards-based science activities! From the chemistry of liquid crystals, to the mechanics of smart wire, to the high tech know-how of new nano materials, science holds the answer to many-a-spy's secrets. In this educator workshop, teachers will learn how to use espionage scenarios as a context for standards-driven science content and activities. Participants will have an opportunity to explore inquiry-based nanoscience activities that can be replicated in the classroom. Join Bob Wallace, former head of the CIA Office of Technical Services for this rare opportunity to gain insight from a real former spy on the role of science and technology in the world of espionage. Working in partnership, the International Spy Museum and the University of Maryland Materials Research Science & Engineering Center (MRSEC) have created resource materials for classroom use. All participants will receive sample materials, lesson plans, and a packet of resource materials to support their classroom teaching. A picnic-style dinner will be served. Space is limited! Call 202.654.0932 to register today and download the flyer to share with colleagues! [04/07/10] MRSEC at Maryland Day! 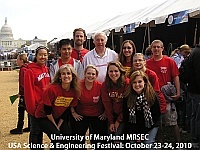 Join MRSEC and the Physics Department for Maryland Day on April 24, 2010. Maryland Day is a time when the University of Maryland, College Park opens its doors to the public. With demonstrations, exhibits, workshops, performances, petting zoos, and much more, Maryland Day provides something for everyone! MRSEC will be returning some of its favorite make-and-takes, including silly putty and bracelets with color-changing, UV-sensitive beads. MRSEC will also be making liquid nitrogen ice cream, a treat for all ages! Find out more about MRSEC at Maryland Day and be sure to stop by! MRSEC will be providing hands-on science activities for NanoDays at the Spark!Lab of the Smithsonian Museum of American History's Lemelson Center on Saturday, April 3. Stop by and see why thinking small is the new big thing! Michael Fuhrer, a leading expert on nanoscale electronics from the Materials Research Science and Engineering Center (MRSEC) at the University of Maryland, will discuss his research in the field as well as the role of nano-electronics in past, present, and future innovations. For more information, see the Lemelson Center's Upcoming Events. The Maryland MRSEC will be at the Port Discovery Children's Museum in Baltimore, providing hands-on science activities focusing on nanoscience. Join us, and zoom in on the Nanoworld! Play the Scale Down to Nano Game and make your own Nanoruler to measure the world around you. Meet scientists and talk NANO! You can also help us build a Giant Nanotube out of balloons; together we will create a giant-size model of a tiny, but powerful structure that is shaping our world! You'll also make your own paper model of a carbon nanotube to take home. MRSEC is co-sponsoring its 4th annual "Operation Night Spy" KidSpyTM Workshop for ages 10-13 at the International Spy Museum on Thursday, February 18 from 7PM to 9PM. Registration and details can be found at the Spy Museum website. Information about the UMD-MRSEC 2010 REU Program has been posted. Undergraduate students from around the country may apply to come to the University of Maryland for the ten-week program, during which they will work with MRSEC faculty on interdisciplinary materials research projects involving chemistry, physics, materials science, and engineering. See more details about the REU Program. Starting October 2009, the MRSEC has available seed funding of approximately $150,000 per year for a period of one to two years. This funding will be used to support new research directions with the potential to nucleate a new Interdisciplinary Research Group (IRG) program or a new IRG direction. Proposals for seed projects should be submitted on or before September 1, 2009. Along with the seed propsals, the MRSEC is also soliciting white papers which propose the nucleation of future MRSEC IRGs for the 2011 renewal. Details are included along with the seed call. Information about the University of Maryland MRSEC's 2009 Summer Camp Programs has been posted. Please see the Summer Programs page in the Education section for details. MRSEC Associate Director Donna Hammer was awarded the prestigious 2009 College of Computer, Mathematical, and Physical Sciences (CMPS) Dean's Award for Excellence at the CMPS 21st Annual Spring Academic Festival on Friday, April 24, 2009. MRSEC is co-sponsoring its third annual "Operation Night Spy" KidSpyTM Workshop for ages 10-13 at the International Spy Museum on Thursday, February 28 from 7PM to 9PM. Registration and details can be found at the Spy Museum website. Or print a flyer and invite a friend! Operation Night Spy: The cloak of darkness is a spy's best friend! By the light of day, spies can be easily exposed and missions go awry. But when the sun sets and shadows emerge, espionage is the name of the game. Explore the tricks of the trade that enable spies to operate under the cover of darkness. From infrared night goggles to ultraviolet-light secret messages, young recruits will try their hand at creating and using tools that will help them spy in the shadows. With scientists from the University of Maryland by their side demonstrating cool technology and materials, mission failure will not be an option. Will KidSpy recruits see their way through? Will darkness help or hurt them? Only those with top secret access to Operation Night Spy will discover the answers to these questions.